Flat Rates and Reducing Balance Rates are the two prevalent rate structures employed by lenders to fix the cost of borrowing. Personal loans usually attract interest in the range between 10.75% and 25% per annum. Rates can be higher of course, usually dependent on an individual’s credit standing. Applicants with a poor credit score and those without a credit history are usually offered a higher interest rate. Various other parameters including income, repayment behavior and employment stability also impact interest rates offered on personal loans. Lenders use risk-based pricing to determine interest rates on loan applications. Under this model, an applicant’s credit behavior is evaluated, and the cost of borrowing is determined by calculating the approximate probability of a default. In accordance with the risk-based pricing model, individuals with poor credit health are understood to be more likely to default, thereby shooting up the rate offered on the loan application. 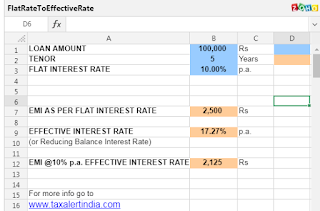 Under the Flat Interest Rate regime, interest is calculated on the entire loan amount, against the tenure. Meaning, if you take a loan of Rs 1,00,000 for a tenure of 3 years against an interest rate of 12%, the interest payable under the flat rate structure is Rs 36,000. In the case of reducing balance rates, the interest is computed on the outstanding principal, after taking into account repayments that are consistently made. As and when repayments are made, the interest is accordingly levied and computed on the remaining balance. While lenders can use both type of rates to advertise their product, the interest rate on a loan under a reducing balance basis is usually higher than under the flat rate regime. Meaning, a Flat Interest Rate of 10% might amount to an interest of 15% or more under the reducing balance basis – this is dependent on the loan amount and the tenure in question. As a borrower, you might find instances where lenders are offering personal loans at rates as low as 8% p.a. This however, isn’t true, as the 8% rate is the Flat Rate, amounting to a rate of at least 15% in accordance with the reducing balance rate method. As such, advertising the flat rate on a personal loan isn’t logical, as the flat rate never reflects the real cost of borrowing. The reducing balance rate, also known as the Effective Rate of Interest, is what indicates the real interest rate on your loan and the amount you’ll be repaying at the end of your loan tenure. As for whether you can choose a rate regime that will hold applicable to your loan, that isn’t possible, since lenders decide what type of rate calculation they use. That said, it is always advisable to know what rate method your loan entails. Knowing the EIR (Effective Interest Rate) applicable on your loan will reflect the real interest rate and the actual amount you’ll end up repaying once your tenure concludes.